Large-scale, international food producer RCL Foods injected vibrancy and energy into its new Durban office by installing a selection of brightly coloured resin floor finishes from Flowcrete. As one of Africa’s leading food producers, responsible for a number of household brand names, RCL Foods aims to portray a high-end image. This design ethos included specifying a variety of floors that would cleverly meet both the aesthetic and operational demands of the site. This was most evident in the building’s test kitchen. A focal point of the new office, the kitchen needed to be both a visually pleasing showroom as well as a practical area for cooking. 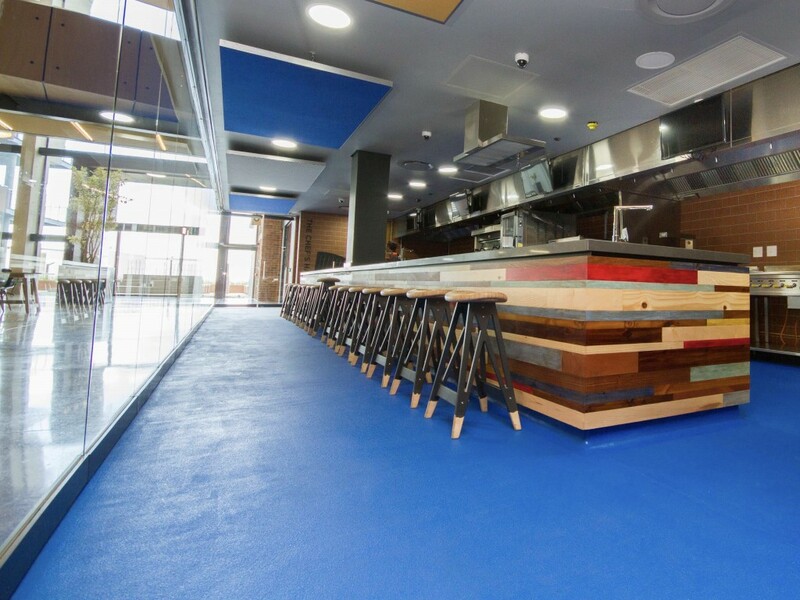 To achieve this, 311 m2 of Flowfresh SR Ultra in a bespoke blue that matched RCL Foods’ corporate colour was installed to link the space to the visual identity of the business. Flowfresh was ideal for the task at hand, as it is a very durable polyurethane system that is able to survive the temperatures, spillages, chemicals and impacts inherent to a busy kitchen environment. This Hazard Analysis and Critical Control Points (HACCP) International certified system provides the highest possible hygiene levels by incorporating the antibacterial additive Polygiene within the floor, enabling it to eliminate up to 99.9 per cent of bacteria in contact with the floor finish. To extend this colourful interior design scheme across the building, 272 m2 of Peran SL Fruity flooring was supplied for the 18 male, female and disabled toilets. This system allowed the designer to use an extensive palette of colours, including Tomato, Kiwi, Grapefruit, Tangerine, Spearmint and Plum, so that no two toilet facilities were the same. The seamless and impervious nature of Peran SL Fruity makes it quick and easy to clean, helping to ensure that the floor maintains a fresh and unblemished appearance. The robust credentials of this self-smoothing epoxy system means that it will withstand the foot traffic, cleaning chemicals, scuffs and scrapes that it will inevitably be exposed to. To guarantee that visitors and staff would be immersed in a colourful and energetic environment from the second they set foot in the building, a decorative floor was installed in the lift lobby on each level of the building’s three-storey car park. As well as this, 378 m2 of the epoxy resin floor coating Peran STB in a dappled grey colour was applied in the lobby areas to provide a pleasant transition from the car park to the office. This combination of floor finishes meant that RCL Foods could rest assured that its new office would have a vivid, contemporary and on-brand surface underfoot that would be able to withstand the various challenges that such a busy and unique office space would throw at it. Flowcrete supplies flooring solutions to transform environments across the globe including waterproof car park deck coating systems, seamless resin terrazzo, durable antimicrobial flooring, fast curing systems and corrosion protection. Flowcrete Australia has offices in Brisbane, Sydney and Melbourne and is part of Flowcrete Asia Pacific, one of the four divisions that make up Flowcrete Group Ltd.